Not much it good it does to have a no smoking policy for the room when your room is in front of the stairwell. All the smokers seemed to hang out and smoke right outside our room and the smell and stench went through the air vents. Not to forget, the smokers were also loud and obnoxious. The good - the staff is excellent! From the manager to Front desk to Housekeeping. They are all great. The bad - Lack of eating conditions at the motel, but that's minor because everything is just a short drive away. Staff was pleasant. Room had termites and ants. Super out dated room. Had to park in the middle of the drive way because there was no parking. Just had an overall unsanitary feeling to the room. enjoyed it Loved the hotel. Beds were very comfy. the only problem we had was that my daughter and grandson went swimming and there were live bugs at the bottom of the pool. Could hear the person snoring in the room next to mine! Absolutely no insulation! Would not stay there again! Basic Older Hotel Older hotel but seamed to be a safe enough area and staff was accommodating. 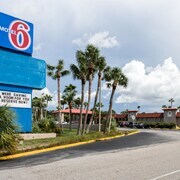 Lots of fast food choices in the area and easy access to I-75 and state route 98/50..Bed was comfy in the room we had, if your looking for a place to stay on a budget this will work. I Like It! Clean rooms, friendly staff, great breakfast! 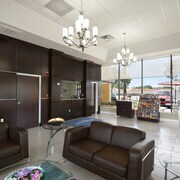 Clean rooms, friendly staff, great breakfast! 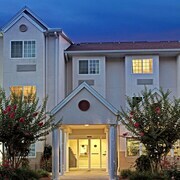 Clean rooms, friendly staff, great breakfast! You don't have to have a trust fund to travel, but you should be rich in knowledge about the region you're staying at! Are you ready to discover a thing or two about Port Richey? 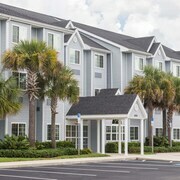 You'll find it approximately 180 miles southeast of Tallahassee, the state capital of Florida, and around 9 miles north of Tarpon Springs. It shouldn't be too difficult to make new friends in this part of Central West Coast Florida. It boasts a population of approximately 3,000 locals. Cheapskate museum fans will be eager to stop by the West Pasco Historical Society Museum and Library. It boasts some great displays, and what's more — there's no entry fee! You could watch countless documentaries to get a taste of the local history, or you could drop by some of the most impressive historical sites for yourself! Spend a couple of hours at the Rasmussen College New Port Richey - West Pasco Campus and dive straight into the past. You won't be put off from visiting USA Fleamarket by a massive entrance fee. So, what are you waiting for — dig out your camera and mosey on over! Amble through perfectly kept surrounds and unique plant collections at Anderson Park, Jay B. Starkey Wilderness Park, James E. Grey Preserve and Brooker Creek Preserve. Nothing compares to interacting with Mother Nature, especially when it doesn't cost a penny! CheapTickets is where fabulous vacations begin — we'll turn your thrifty dreams into realities. We're stubbornly cost conscious, and we'll never make sacrifices on quality when it comes to hotels, flights and outstanding experiences. To travel cheap is to forgo a variety of options, right? Wrong! With 500 partner airlines and over 500,000 properties across the globe, you'll be spoilt for choice. And the best part is you can save as much as $481 if you combine your bookings on hotels and flights. When we say you'll bag yourself the cheapest deal, we're serious. It's a little thing we call our Price Guarantee. We can match the price and refund the difference if you find a cheaper price on your vacation package within 48 hours of making your booking. Not only do we have great deals, we've got sensational rewards too. With our simple program you can save loads of money on any eligible CheapTickets hotel. All you need to do is book your flights! You're just a few clicks away from reaping the benefits. You'll collect savings on eligible bookings, not to mention fantastically scrimpy perks and bonus offers that are sure to have you smiling ear to ear. Just sign up for free or log in, join CheapCash and you're up and running! Listen up, cheapster. We know you're hoping to squeeze the most out of your stay for the smallest amount of dosh, so why not look into hiring a car in Port Richey? It's an excellent way to avoid shelling out on pricey taxis if you're going to move around a lot. Why not pick up your car when you land at Tampa International Airport? It's the easiest way to avoid carrying heavy baggage any further than you have to. Thrifty Car Rental is a well-known option here. Dollar Rent A Car is also in the vicinity. Budget is just 1 mile from the downtown area at 7315 Us Hwy 19 N. So if you'd like to hit the bustling city streets, you know where to head. If they don't have what you're looking for, try Enterprise at 5510 Us Highway 19. This outlet is 3 miles from the city. Take our advice cheapsters — don't dilly-dally around too long! 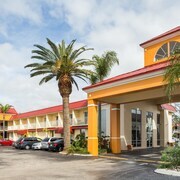 There are just 13 hotels in Port Richey. Book through CheapTickets as soon as possible to avoid being let down. Can't decide where to get a room? 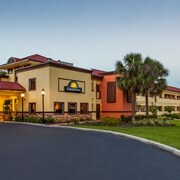 Some top options include the Inn on the Gulf and Homewood Suites by Hilton Tampa - Port Richey.